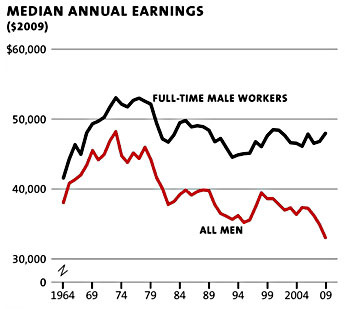 As you can see on the black line in the above graph, median earnings for men in 2009 were lower than they were in the early 1970s. And it gets worse. The decline shown above is actually too mild, because it doesn’t take into account the massive exodus from the workforce of men since that period. Between 1960 and 2009, the share of men working fulltime fell from 83 percent to 66 percent, and the share not making formal wages tripled from 6 percent to 18 percent. 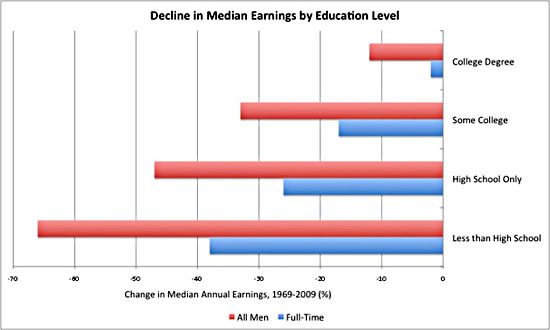 When you take all men, not just those working fulltime, into account, the slight decline in the above graph becomes a plummet of 28 percent in median real wages from 1969 to 2009. ….High school dropouts’ earnings have fallen 66 percent since 1969, and people with some college – the median level of education in the US – have seen earnings fall by a third. Reasonable people can disagree about what caused this massive decline and what should be done to fix it. But it’s a major crisis…. This decline in both male employment and male wages has been going on for 40 years now, and as Dylan mentions, it’s far worse at the bottom of the ladder than at the top. Male high school grads working full time earn 25% less than they used to, and if you account for those not working or working only part time, aggregate wages are down by nearly half. Half! And that’s for high school grads, not dropouts. (And the picture changes only modestly if you add health benefits to the wage picture.) These are men who basically played by the rules, got their diploma, and then went into the workforce. Or tried to, anyway. But they’re finding it far harder to find steady, full-time work than their fathers did, and when they do they earn dramatically less than their fathers did. So I’ll repeat what I said the last time I wrote about this: if you want to understand why marriage has declined among the working and lower middle classes, you have to understand what’s happened to male wages. It’s not the whole answer, but there’s simply no way that it’s not a big factor.